NEW YORK, Nov. 09, 2018 (GLOBE NEWSWIRE) -- At the end of the settlement date of October 31, 2018, short interest in 2,376 Nasdaq Global MarketSM securities totaled 7,840,465,475 shares compared with 7,915,728,981 shares in 2,381 Global Market issues reported for the prior settlement date of October 15, 2018. 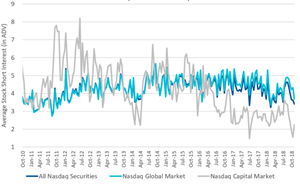 The end-of-October short interest represents 3.66 days average daily Nasdaq Global Market share volume for the reporting period, compared with 4.33 days for the prior reporting period. Short interest in 933 securities on The Nasdaq Capital MarketSM totaled 1,029,111,595 shares at the end of the settlement date of October 31, 2018 compared with 980,735,295 shares in 931 securities for the previous reporting period. This represents 2.25 days average daily volume, compared with the previous reporting period's figure of 1.55. In summary, short interest in all 3,309 Nasdaq® securities totaled 8,869,577,070 shares at the October 31, 2018 settlement date, compared with 3,312 issues and 8,896,464,276 shares at the end of the previous reporting period. This is 3.41 days average daily volume, compared with an average of 3.61 days for the previous reporting period.